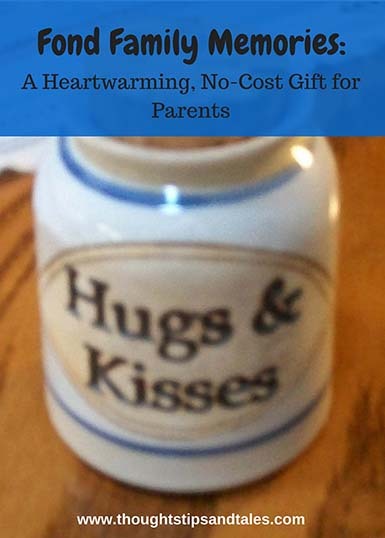 Get a mason jar for $1 at a craft store, find a canister or tin at a thrift store (like the Hugs & Kisses jar above), or repurpose a container you already have. Make a sign for the jar, punch a hole in it, and attach it with a jaunty ribbon or cord. Next, contact your siblings or other relatives and compile a list of memorable experiences each person had with family members. Think of vacations, school, outside activities, traditions, individual quirks, milestones, pets, birthdays and holidays, family jokes, special events and more. Write or type a sentence describing each of the memories on a piece of paper and cut it into individual slips, then insert them in the jar. Close the lid, wrap the gift, and you’re ready for Christmas! My sister and I made this gift for our parents about five years ago, and it was fun to compile the list and reminisce about various experiences. We both remembered different events from our childhood — and we came up with at least 50 heartwarming memories. To maximize the experience, our parents took several years to read the items one at a time (they’re not ones to rush into things!). They really liked it, though — and after they’d finally read everything, they asked us how we remembered all that stuff! I hope it made them realize how they’ve shaped and inspired us, and what great memories we have of them. This entry was posted in Christmas, Christmas gift, Christmas present, family, fond family memories, gift, gift that people love, gift-giving, heartwarming memories, no cost gift and tagged Christmas gift for parents, family memories, fond family memories, gift for parents, heartwarming gift, no-cost gift. Bookmark the permalink.